If this website appears to be messed up, it may be because you are using a browser which doesn't support the technologies included here. For more information, please visit the WaSP Browser Initiative. If this is not the case, your browser may have stylesheets disabled. For more information, please consult your browser's documentation. The Norwegian software company Opera Software recently released version 6.0, beta 1 of its browser suite. I took a few minutes to download the browser over my broadband connection, and I evaluated what I saw. I've known Opera since version 2.5 in 1998, and I've embraced their product for its speed, stability, ease of use, flexibility, and support for standards. So you'd think I'd be once again overly pleased by Opera's newest browser, which is their best attempt yet to push their product to users of Microsoft Internet Explorer and Netscape Communicator. Unfortunately, the new features and looks drove me away. It appears that Opera continued its support for skins, introduced since version 5.0. This feature is similar to that in Netscape 6, but its integration proved buggy and ugly, due to not being smooth. As you can see in the screenshot provided below, several items appear out of place, and one using the browser may notice some objects not behaving as expected. Fortunately, the browser can be reverted back to its classic look, but only after searching through an improved but still confusing preferences dialog box for the option. Version 6.0 introduces a radical new change: Users now have the option to switch Opera to a single document interface model, similar to that of other browsers. It includes tabs for a more multiple-document interface, similar to that in Mozilla, the basis for Netscape 6. I found this approach acceptable, but not nearly as flexible as the multiple document interface I've known Opera for. 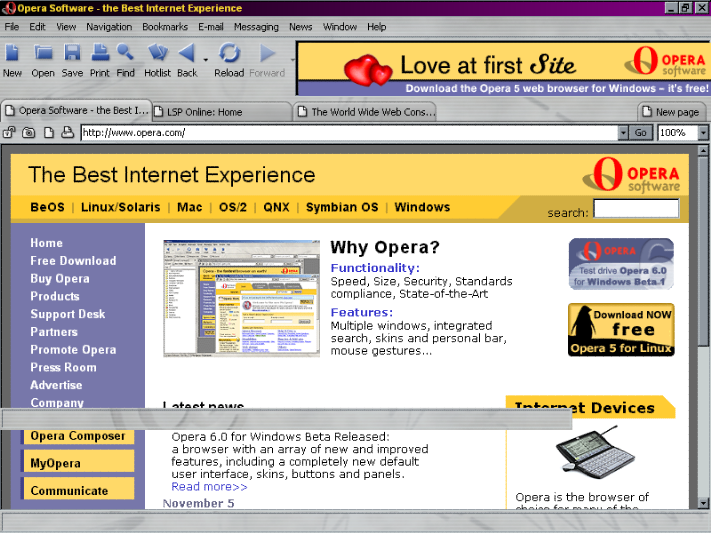 As a sidenote, Opera once prided itself on having a multiple document interface, as one can see on an old advertisement banner for Opera. Also new in Opera 6 is its support for Unicode, which allows the display of characters and languages from around the world on the computer. Although it is a bold move and a long-awaited one, the feature is far too buggy and unimplemented. One would hope that this feature will be complete or nearly complete in the final version. Please note that the rating system is still under development, and this is just temporary. Got something constructive to say? E-mail us! Copyright © 2001 The Loveland Schools Press. Use of this website requires full consent to the terms and agreements.